You love your dog with all your heart, so help protect your dog's heart with Vetmedin (Pimobendan). 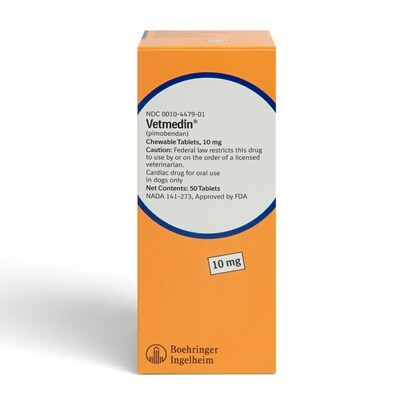 Vetmedin is a prescription inodilator that helps extend the life expectancy of dogs with congestive heart failure by helping the heart pump more efficiently. Vetmedin opens up the blood vessels that take blood away from the heart, reducing the work heart has to do to pump blood. It also opens up the blood vessels returning blood to the heart, reducing pressure on the heart. Talk to your vet about Vetmedin to find out if it's right for your dog. Side effects may include loss of appetite, lethargy, diarrhea, difficulty breathing, weakness, incoordination, fainting, cough, and sudden death. Consult your veterinarian if any side effects occur or worsen. Notify your veterinarian of any additional medications, including vitamins and supplements. Interactions may occur with pimobendan and verapamil, propranolol, theophylline, and pentoxifylline. Follow the exact specifications prescribed by the veterinarian. Dose is based on body weight, divided into 2 portions to be given every 12 hours.